Our best workshop! 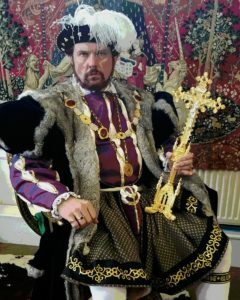 We have delivered many successful educational workshops over the last ten years on the Tudors, and are proud to present our activities for schools studying The Tudors at KS2. 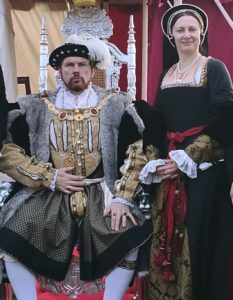 A typical day brings a Royal visit from King Henry VIII and Queen Anne Boleyn. Sessions may involve more than one costumed educator as you wish and budgets allow – up to seven is possible in a day for larger schools, so students benefit from a carousel of activities on a variety of topics; music and dance, courtesy & etiquette, life in the Royal Palace, medicine & surgery, falconry & hunting, contrast between rich & poor, clothing, food, religion, and warfare. Themes covered include: The Tudor family, the Battle of Bosworth Field, Six Queens, The King’s Great Matter, The Dissolution of the Monasteries, , the Act of Supremacy, the Tudor legacy. All with role play and dressing up! Our selection of objects for role-play, study and handling is second to none – after lunch we can offer writing with quill and ink, making pomanders, making Tudor flags etc, and we can finish off the day with a display of longbow, crossbow and a BANG from a Tudor musket if conditions allow. This entails us changing into lower class clothing at lunchtime. We have NATIONWIDE COVERAGE to enable us to deliver our school workshops across the country, we make history happen! See our Tudor Facebook page for more images.